Yep. Camper fever is also known as cabin fever, however, I live in a camper so…..yeah. We’ve been in one place for too long. I know that. You know that. But you know what? It’s too cold everywhere else, so I guess we’ll just stay put. We have been in Texas since the end of November. At first we figured we’d just stay here through the holidays and then move on once all the wintery weather travelers were back home. We soon found out that the only place to go in January is either Floriday, Louisiana, or Texas! Florida is the wrong side of the country, Louisiana has far to many mosquitoes, so by process of elimination, Texas was where we decided to hang our hats until the crocuses started croaking! Don’t get me wrong, I like it here at Rainbow’s End. I actually am quite fond of this park and the community feel to the whole place. There is quite a lot going on in the park as far as activities go, so we always have something to do. 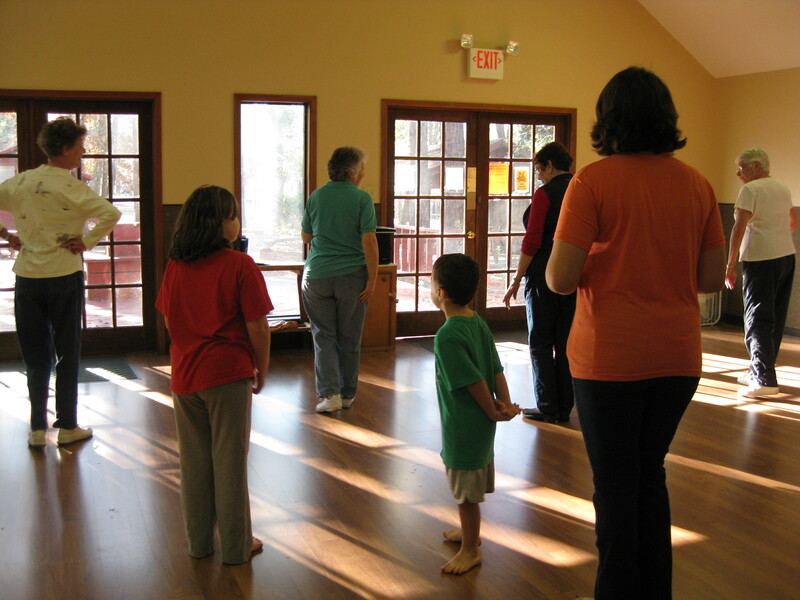 The kids and I are enjoying learning how to line dance, going to the movies once a week, and attend the ice cream social. 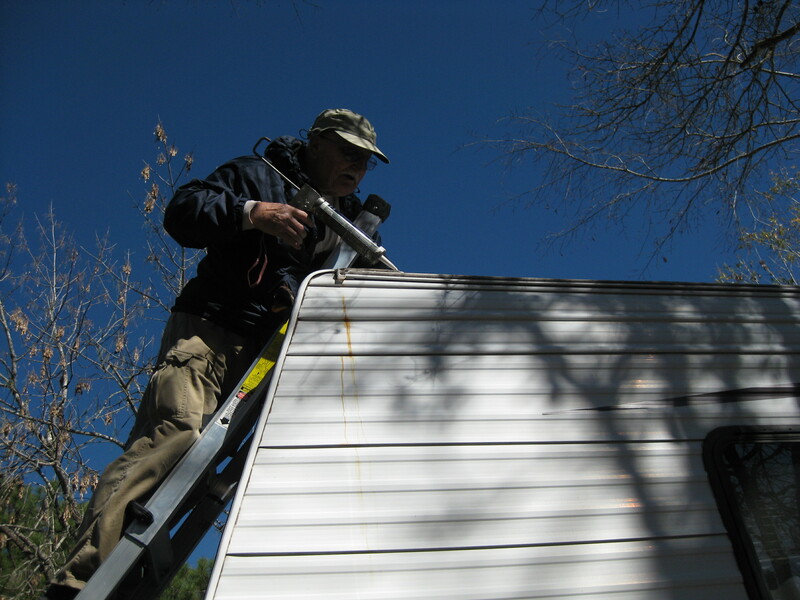 There is also an abundance of retired rv’ers who are keen on dispensing pertinent rv lessons and know how (needed or not) to any willing listeners. So, when I have a leak and it’s rainy, I always am in capable hands who jump at the opportunity to rescue a damsel in distress! And yes….it’s been raining…and we’ve found leaks. Quite a few to be honest….enter adopted family member Bob. 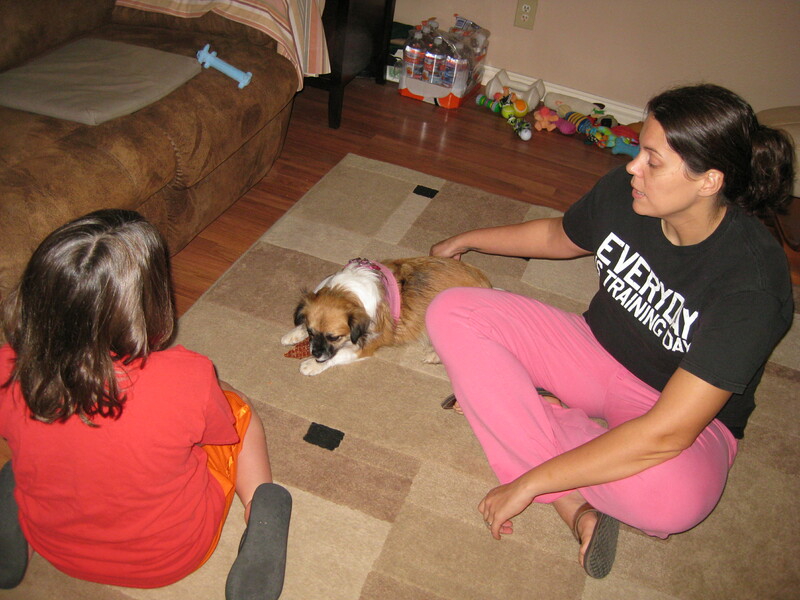 We met Bob because of his dog Beauty, whom the kids (and I) love to death. He was kind enough to give me a shopping list and then bring his tools and ladder over to “show” me how to recaulk the roof and also walk the roof and check for leaks! sealant is the black stuff…thin and broken allowing leaks! 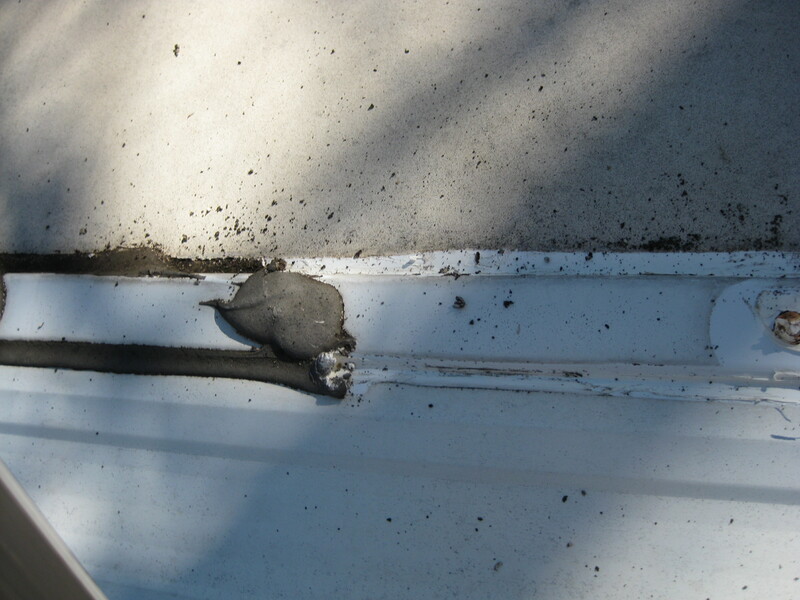 We ended up using cement tape for the front and back seams and then caulking around the edges and corners. That took care of most of my leaky ceiling issues. We also had a problem with one of the back access doors leaking (or gushing rather) when it rained hard. It just so happened that it was the door that was right next to Grace’s bed. Bob helped reseat the door and drill new holes for the hinge creating a better seal so it wouldn’t leak. Problem fixed just like that! He has been a great help and has turned into a great family friend as well. I’m sure we’ll all be sad to say goodbye to him and Beauty once we decide to leave. But for now, Rainbow’s End is where we are parking it. I’m sure that will change soon. Spring has sprung here in Texas and as soon as we do a few more odd jobs with the camper we’ll be shoving off into the great beyond. We have a party to get to at the end of March as well as some amazingly super cool things in the works that I can’t share with you yet but you should definitely stay tuned!! So, so long folks, I’ll try to be back and give you an update soon! Previous PostJust BreatheNext PostLike Nothing You’ve Felt Before! Wish we’d known you guys were there at Rainbow’s End! We were there for a few days last week. We’re now west of San Antonio, and heading to New Mexico tomorrow. sorry we missed you but really glad you found Caboodle!